When an attack hits its target, the player with the weapon has a choice. They can either damage the target or chose to remove two cards from the target. The attacker has the choice of damaging the target or discarding the cards. They make their choice after the target does not use an Escape. If Wine is used in combination with the Ice Sword, the damage is either all or nothing. Either the attack causes two damage or the target loses two cards. The cards are discarded one by one. If the target only has one card, they lose it. If they have more than one, two cards must be removed. If they have no hand, they must be damaged. Either equipment or hand cards can be discarded. Pending cards cannot be taken. Hua Tuo needs to watch out for this weapon because it can cost him double for each hit. 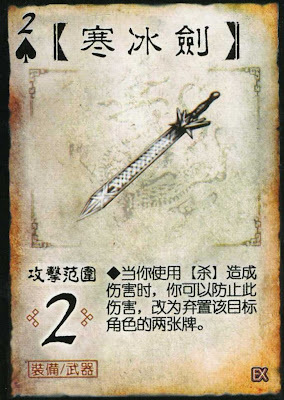 Rather than losing a single card for healing back the damage, Hua Tuo could lose two from the Ice Sword. After he is worn down with this weapon, it will be hard for him to recover. Xiao Qiao is very susceptible to this weapon since it has to ability to not damage the target. When she is attacked, she must first decide if she will use an Escape. If she does not, then the attacker can decide to not damage her and discard her cards instead. Since there is no damage, she cannot pass this and is out the two cards. The Ice Sword is the kind of weapon that you really need for a few turns at a time. It is the best at stripping away a targets equipment one hit at a time. Most importantly if you can sneak in a blow, removing their armor and defenses. Then, move in with the damage. Unfortunately, the Ice Sword won't help you in the long run. Sure you can keep taking their cards away, but they will just draw more and you're not hurting them. It is still useful though, since you always have to option of just damaging your victim as well. The Ice Sword is a creation for this game and is not in the novel.